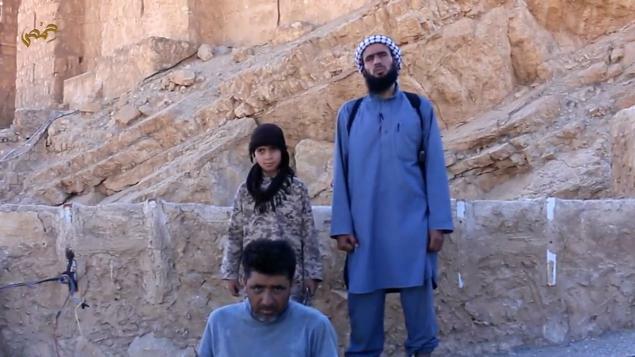 Photos left and above: Child executioners in Palmyra. 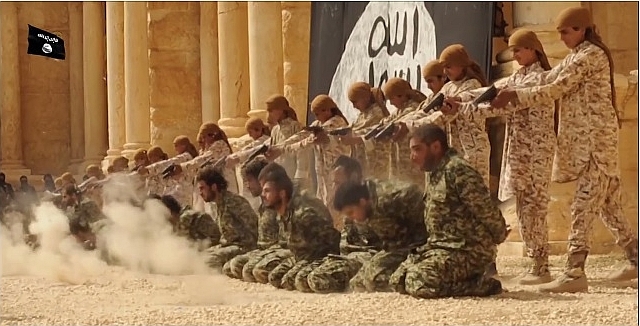 The first day ISIS captured Palmyra, ISIS "cubs" executed all captured Syrian Army members. The executions were held at Palmyra's World Heritage site, which they blew up afterwards. 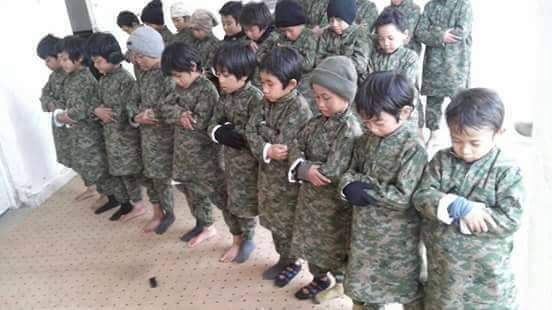 ​On February 6, 2016, Islamist "opposition" groups put child fighters on the frontline during an assault on Syrian Armed Forces. 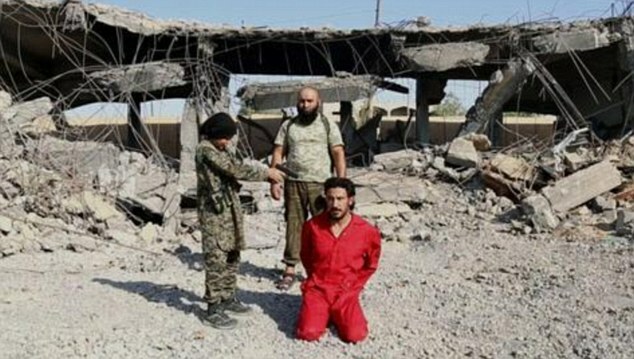 The Islamist groups were a coalition of groups consisting of al-Qaeda in Syria, the US-backed "Free Syrian Army," Harakat Ahrar al-Sham, and Harakat Nouriddeen al-Zinki (a U.S. backed group who torture and behead children, see: us-backed-group-beheads-boy.html). The "Jihadi Junior" assault occurred during a battle in Aleppo’s northern countryside. Syrian Armed Forces had liberated several towns from these terrorist groups during the previous days and the Islamist coalition rallied and came back with their child fighters. 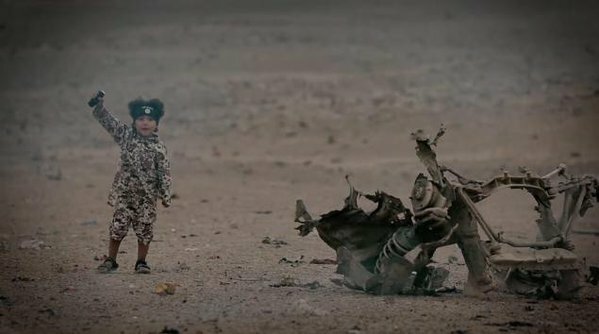 Soldiers in the Syrian Forces reported that a very large number of child soldiers were placed on the frontlines of the assault. The majority of the children were pre-teens, estimated between the ages of 10-12 years old. 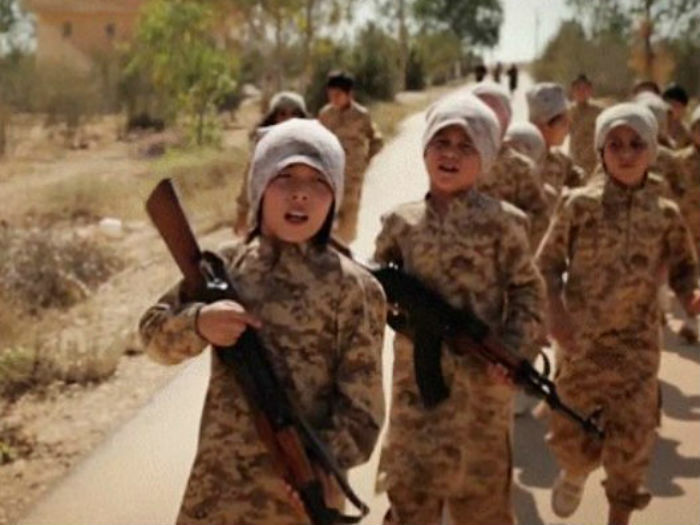 It has been well known that ISIS has child training camps for girls and boys. ISIS frequently posts video and still photos from these camps. The children spend several hours every day memorizing the Quran, learning how to conduct suicide bombings, and training for battle. They are also trained to be executioners. 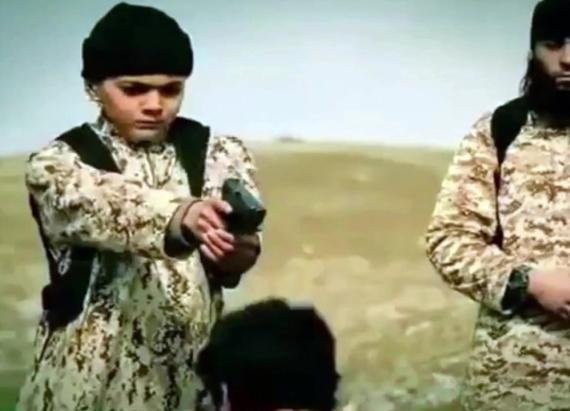 Now the other various “opposition” groups, who consist primarily of foreign fighters funded by Turkey and Saudi Arabia, are also using child fighters. Syrian Army members who were confronted by these children were so alarmed at such a large presence of child fighters that they retreated. ​Child fighters have been used by al-Qaeda in Syria and the U.S. backed "Free Syrian Army" in large cities such as Aleppo and Damascus, but have never used a child "army" this large on the front lines before. 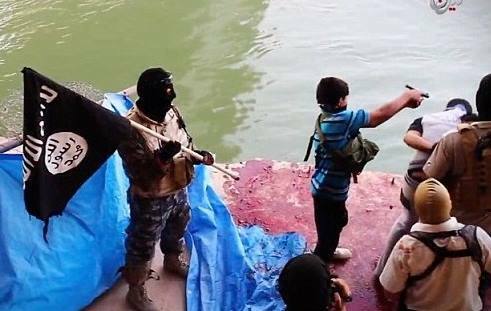 In 2015, ISIS repeatedly displayed new arrivals of child fighters from many various countries. It makes you wonder who the "refugees" waiting at the Turkish border, who want to seek refuge in Europe and the U.S., really are. Photo right: Child fighters arrive in Syria from Chechnya. 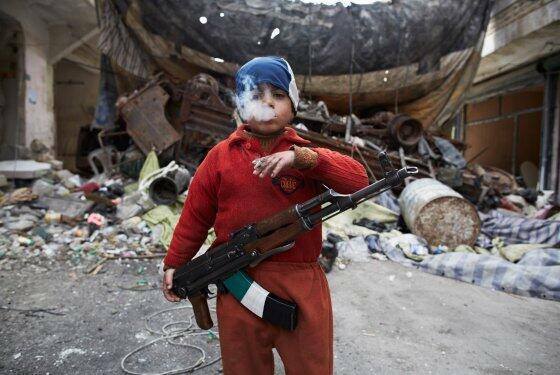 Photo Left: Child "opposition" fighter (child of al-Qaeda) in Damascus. Jaish al-Fateh: An Islamist coalition comprised of several Islamist groups; the main ones being Jabhat al-Nusra (Syrian al-Qaeda), Harakat Ahrar al-Sham (the movement of Free Sham; or freeing Sham to Islam), the Free Syrian Army (the US-backed group), and Jund al-Aqsa (al-Qaeda affiliate). Jaish al-Fateh means the “Army of the Opening”, as in taking a country for Islam. Jund al-Aqsa: An al-Qaeda affiliate. Jund means ‘soldiers’ and Aqsa is the mosque in Jerusalem. To Muslims, when Islam takes Jerusalem, it means Islam will then conquer the world. Harakat Ahrar al-Sham (the movement to Free Sham, or freeing Sham to Islam). Sham is Syria, Lebanon, Jordan and Iraq. Several Islamic terror groups are fighting for Sham—to make the entire region of Sham into an Islamic Law region; to destroy the national borders and create one Islamic Law region with only Islamic Culture. Anjad al-Sham: Roughly translated as the Glory of Sham (i.e. the people who are making Sham glorious—via Islamic Law). Jabhat al-Nusra: Means “victory front”. Jabhat al-Nusra, or al-Nusra, stands for the Islamic Army’s front line of fighters for Islam, and of victory for Islam. This is the largest al-Qaeda affiliate in Syria. Al-Nusra has been a long time supporter of various “opposition” groups including Jaish al-Islam, Ahrar al-Sham, and the Free Syrian Army. If ISIS is ever taken out, it will be al-Qaeda’s al-Nusra that will continue the Global Jihad. Liwaa Suquor al-Sham: The Eagle Troop of Sham. This group is like a large battalion of fighters for uniting Sham under Islamic Law. When called upon by other groups, they arrive as reinforcements. Jaish al-Islam: The Islamic Army. This is a large Islamic group, or army, who fights alongside other Islamic groups in an attempt to take more territory for Islam. This groups is funded and armed by Turkey and Saudi Arabia and arms and militants arrive from Turkish and Jordanian borders. Jabhat al-Shamiyah: Army Front for Sham; i.e. Front line of fighters for an Islamic Sham. Free Syrian Army: This group was started by the Syrian Muslim Brotherhood and funded by the Egyptian Muslim Brotherhood, but no longer consists of Syrian nationals. The remaining members of the Free Syrian Army have joined ISIS at times, and al-Qaeda at other times, and most recently have been fighting alongside al-Qaeda or with Jaish al-Fateh (the largest coalition of Islamist groups).